One annual end-of-summer tradition in our household is attending the Iowa State Fair, held in Des Moines each year in mid-August. It’s something we look forward to for weeks. Over the years, we’ve found a bunch of little techniques to turn what could be an expensive day trip into something much cheaper. If you invest some time and forethought into it, you can easily make a day at the state fair into a very cheap and fun family activity for everyone. Here are eleven tactics to try. Get tickets well in advance. If you don’t know where to buy advance tickets, check online at the website for the fair and find out. Around here, grocery stores sell the tickets, usually at half the price of what you would have to pay at the gate. That means our family of four is able to get in the door at the State Fair for $10 rather than $20. Another option to consider is attending the fair on a day where the price is reduced, usually in the middle of the week. For example, the 2008 Iowa State Fair was free on the first day until 8:30 AM, plus you got a free corn dog upon entry. This encouraged an enormous showing of people that day, of course, but you can’t argue with the price. Again, check out the website of the fair well in advance so you can be aware of any discounted admission periods. While this was difficult for us this year with two young children who needed naps, most years we make a full day out of the trip to the fair, intending to get in the door not long after sunrise and leaving at sunset. Doing this maximizes the value of your admission, as you get many hours of entertainment out of your ticket instead of just a few. The best tactic for making the “full day” work is by eating a filling meal before you go, so you’re less tempted to buy overpriced food while actually inside the fair. That means a big breakfast – make some pancakes, for example, and have some eggs with them. The goal is to keep you full (and full of energy) through a long day that will be spent mostly outside during the summer. Along those same lines, bring a water bottle for each member of your group. Almost all fairgrounds have water fountains where you can fill your bottles. This eliminates the need to spend money on beverages during the day, again drastically reducing the expense of a day at the fair. If you do some advance planning, you can not only make sure you hit all of the most interesting stuff at the fair in a day. Look not only at a schedule of events for the day, but also find a list of all the continuing exhibits. That way, you can make a list of all the stuff you want to hit and even plan something of a route through the fairgrounds so you don’t have to backtrack much. 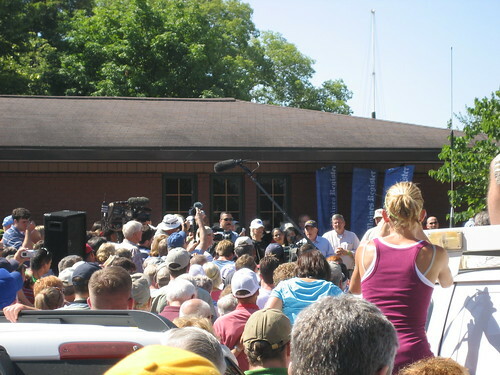 If you can’t spot him right off, he’s right next to the first blue banner, near the middle of the picture, wearing a navy colored hat. Since we had small children, we chose to stay at the back of the crowd. Doing these things ensures you hit all the interesting stuff you want to see at the fair without missing things or backtracking, making the day more enjoyable (and likely making it possible to see more things). To attend the State Fair, my wife and I usually parked at a friends’ house in Des Moines, then use the free shuttle bus running through town to go to the fair. This meant we saved the cost of parking near the fair, which can often become very expensive. This little move might take a bit longer, but it shaves some extra cash off of the trip (and often makes it very easy to meet up with friends and attend the Fair together). Beyond that, we visited the Iowa Public Television booth (where my son had an awkward conversation with Clifford the Big Red Dog), the Republican Party and Democratic Party areas, a petting zoo, a demo station for the video game Rock Band (which I’m very bad at on the drums), and a bunch of other things I’m forgetting. All of this was thoroughly enjoyed by everyone (even our infant daughter) until nap time approached. 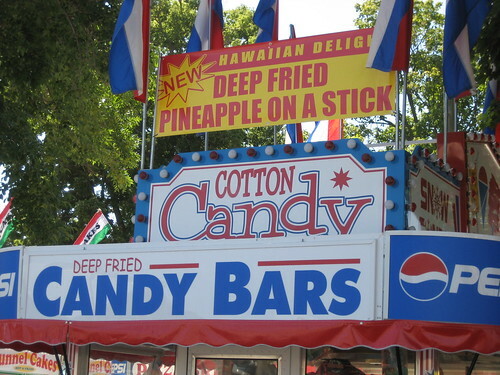 Deep fried pineapple on a stick, indeed. We were intrigued, but passed that one up. Instead, we let our son pick out an item to share and he chose a very good hand-dipped ice cream cone that we all shared. That gave us all a tasty treat for a pretty low price. At many state fairs and other such events, there are tons of opportunities to pick up free items of all kinds, but just because something is free doesn’t mean it’s worth taking. I attempted to count the number of giveaways I spotted and I lost count somewhere north of two hundred in just under three hours. However, you can find worthwhile stuff if you look carefully. My wife and I got two free canvas bags for using at farmers markets, a free chamois for car washing (which will go in the rag box, but be a useful rag), and a free copy of the day’s Des Moines Register. My son picked up a few coloring books and, best of all, two different Clifford the Big Red Dog books, which have already been read several times. Nothing breathtaking, but worthwhile stuff and the price is right. Just be sensible about it and take only stuff you’ll actually use. A final tip: always get a readmission stamp when you leave. You never know why you might need to go back into the fairgrounds – and if a reason comes up, you don’t want to have to pay for another ticket. Follow this, even if you believe you’re leaving for the day. 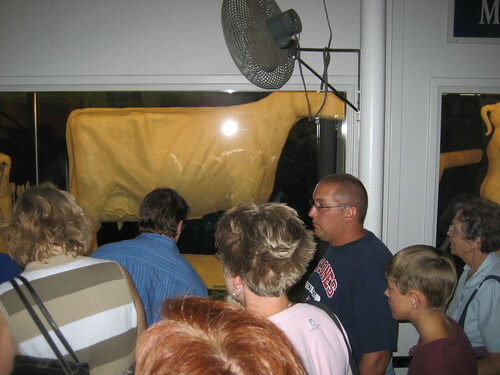 You may have accidentally left an item inside, or you may remember that you promised someone a picture of the Butter Cow, and you certainly don’t want to pay admission again, do you? 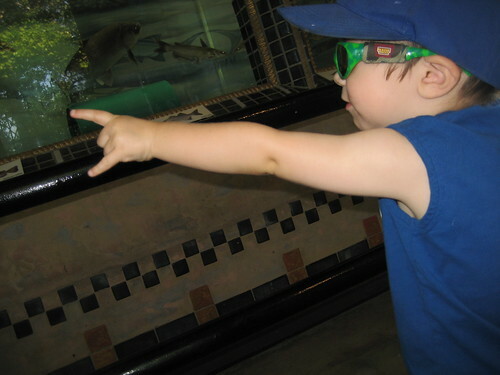 Fairs are a great way to have some family fun in the summer, and they don’t have to be very expensive at all. Have a good time!